Marquis Companies has been in business since 1989. 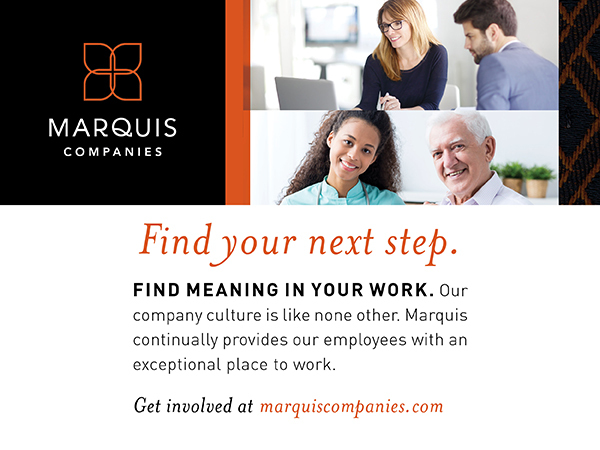 Marquis Companies is a growing and dynamic healthcare organization that employs several thousand employees across California, Oregon and Nevada. Marquis Companies consists of: Post-Acute Rehab and Assisted Living Facilities, Marquis at Home, Consonus Rehab and Consonus Pharmacy. Marquis Mt. Tabor is now enrolling students to our FREE Nursing Assistant Training Course! Marquis provides a Level 1 Nursing Assistant Training for people interested in careers as a Certified Nursing Assistant (CNA). We are interested in training people that are passionate and committed about pursuing a career as a CNA in the Long-Term Care industry. The primary responsibility of a student that is selected for the Marquis Companies Nursing Assistant Training Course is to acquire the knowledge, skills and certification as a Certified Nursing Assistant (CNA) by successfully completing the entire course. This class prepares you to take the State of Oregon CNA certification exam approximately one (1) month after course completion. For consideration into our training course, you begin by submitting an application electronically. If your application is selected for an interview, it will be determined after the interview if you are accepted into the Marquis Companies Nursing Assistant Training Course. For enrollment into this course, you must also be able to provide legal documentation establishing your identity and eligibility to be legally employed in the United States; pass a criminal background check; pass employment reference checks; and be at least 17 years of age. Fingerprints will also be required prior to beginning the training course by the Oregon State Board of Nursing (OSBN). If you successfully pass quizzes, the final exam and other evaluations, you will be eligible for graduation from our course and to take the State of Oregon CNA Exam. Employment opportunities as a CNA may also be available within any of the thirteen (13) Marquis Long-Term Care facilities in the Portland Metro area or the Marquis At Home agency. After completing the Marquis Companies Nursing Assistant Training Course you would be eligible to apply for these CNA job openings. Or learn more about careers with Marquis Companies at www.marquiscompanies.com.